They say that tenor Enrico Caruso came up with this dish. Caruso, a native of Naples, had a love-hate relationship with his home town. After he was booed at a performance early in his career, he never appeared on stage again in his native city, saying he would return only to eat the pasta. When he was in the area, he stayed at either the Hotel Vittoria in Sorrento or the Hotel Vesuvio in Naples. The dish was born when he suggested this sauce to the hotel chefs, and the rest, as they say, is history. 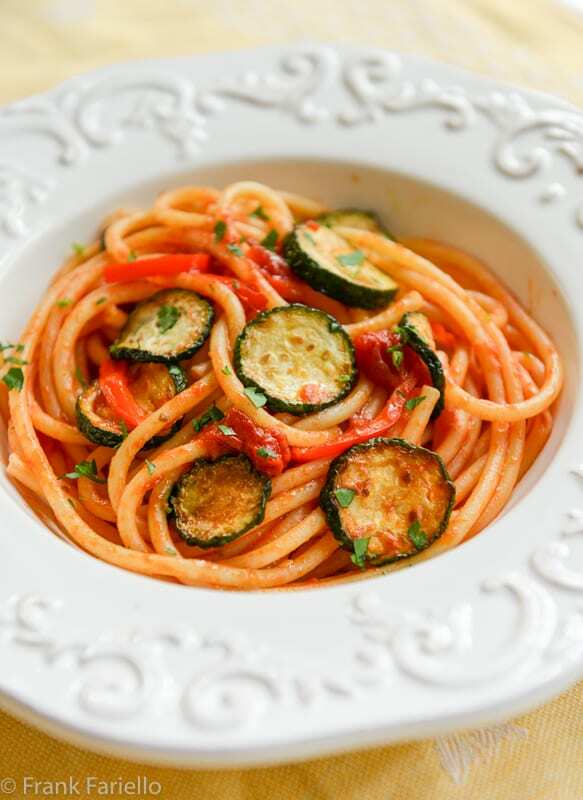 To make bucatini alla Caruso, you dress the pasta with a light tomato sauce scented with bell pepper, oregano and hot red pepper, then fold in fresh basil and fried zucchini. It’s a dish that features many of the bold flavors we think of as typically southern Italian. But here those flavors are used with discretion and nuance, producing a dish that’s as light as it is flavorful. It’s a far cry from the heavy-handed cooking you’d find in those ‘red sauce joints’ that for many people made Italian food synonymous with heartburn. This is what southern Italian cooking really about. Set a large pot of water to boil and salt it well. Sauté the garlic cloves lightly in abundant olive oil. Remove when they’ve browned, but are still not very dark. Add the bell pepper and let it sauté for just a minute or two, then add the chopped tomatoes, along with a pinch of oregano and a pinch of red pepper flakes. Simmer until the mixture thickens into a sauce, about perhaps 10-15 minutes. While the tomatoes are simmering, add the bucatini to the boiling water. Meanwhile, trim off the tops and bottoms of the zucchini, cut them into think rounds, then shallow-fry them in olive oil until golden brown on each side. Drain on paper towels and salt generously. When the bucatini are done al dente, transfer them to the pan with the sauce, along with a few fresh basil leaves and most of the fried zucchini. Mix for a minute or two over low heat then serve, topped with the rest of the fried zucchini slices and, if you like, a sprinkling of finely minced parsley or grated Pecorino cheese. Most recipes for bucatini alla Caruso call simply for San Marzano tomatoes. In this country, that basically means the canned variety. But the dish works well with either fresh or canned tomatoes, San Marzano or not, so long as they are tasty. If you want to use fresh tomatoes outside of peak tomato season—still a good month away in these parts—I’d go for a quality brand of hydroponic tomato. Cherry or grape tomatoes, cooked for only 5 minutes or so, until they have wilted but not dissolved, would make for a lovely variation on the basic recipe. The amount of tomato varies from recipe to recipe, so follow your own tastes and preferences. The amount given here is my preference; it provides only a light tomato coating to avoid overwhelming the delicate taste of the zucchini. As for the zucchini, as always look for ones that are small and solid, rather than the dark green “baseball bats” you often find in supermarkets, which tend to have rather mushy flesh. Let the zucchini slices brown but not get too dark, as they tend to turn bitter. Your bucatini alla Caruso will be even better if the zucchini are from your own garden, of course. A bit of minced parsley sprinkled on top is nice for color. If you want cheese—personally I think the sauce is tasty enough without it—the choice would be a sharp pecorino to hold up to the other bold flavors in the sauce. The question might be odd for those of us of a certain age. I can remember listening to a scratchy recording of Caruso’s singing as a kid on my grandparents’ Victrola, as they called it back in the day. He was an iconic, even mythical figure back then. These days, however, I suspect most people know him, if they do, from Lucio Dalla’s haunting eponymous song, said to have been inspired by an unplanned stay at the hotel—and in the very room—where Caruso died. Enrico Caruso was born into a working class family in Naples in 1873, the third of seven children. He began his singing career in the local church choir. After his mother’s death took to singing in the streets to earn some extra money for his family. He then found work in cafés and dinner parties and eventually at the Teatro Nuovo in Naples and other provincial opera houses. He finally got a contract to sing at La Scala in Milan in 1900, taking part in a grand concert at La Scala in February 1901 that Toscanini organised to mark the recent death of Giuseppe Verdi. Caruso’s big break came in 1902, when he was engaged by the Gramophone & Typewriter Company to make his first group of acoustic recordings in a Milan hotel room for a fee of 100 pounds sterling. They became best-sellers. The following year he made his debut at the Metropolitan Opera in New York in a performance of Rigoletto. Just a few months later, he began his lifelong association with the Victor Talking Machine Company. His recording career ran in tandem with his Met career, both bolstering each other, until his death in 1921. Thanks in large part to his tremendously popular phonograph records, Caruso became one of the most famous personalities of his day. He was one of the first examples of a global media celebrity. Sadly, Caruso died young at the tender age of 48. His health had begun to deteriorate after a stage accident in 1920. As he was on his way to Rome to see his doctors, staying overnight in the Vesuvio Hotel in Naples, he took an alarming turn for the worse. He died in the hotel shortly after 9:00 a.m. local time, on 2 August 1921. His body was preserved in a glass sarcophagus at Del Pianto Cemetery in Naples for mourners to view. In 1929, his widow had his remains sealed permanently in an ornate stone tomb that you can visit today. There is another dish going around the English speaking world by name of Spaghetti Caruso. A very different dish from this one—tomato sauce with chicken livers and mushrooms—that’s more autumnal and, I would dare say, more Tuscan sounding than Neapolitan. This source claims it was Caruso’s favorite pasta dish, but I really wonder about that. I haven’t found a reference to the dish in any Italian language source. Sauté the garlic cloves lightly in abundant olive oil. Remove when they've browned, but are still not very dark. Add the bell pepper and let it sauté for just a minute or two, then add the chopped tomatoes, along with a pinch of oregano and a pinch of red pepper flakes. Simmer until the mixture thickens into a sauce, about perhaps 10-15 minutes. Meanwhile, trim off the tops and bottoms of the zucchini, cut them into thin rounds, then shallow-fry them in olive oil until golden brown on each side. Drain on paper towels and salt generously. When the bucatini are done al dente, transfer them to the pan with the sauce, along with a few fresh basil leaves and most of the fried zucchini. Mix for a minute or two over low heat then serve, topped with the rest of the fried zucchini slices and, if you like, a sprinkling of finely minced parsley. The bucatini recipe is certainly from Naples.Spaghetti Caruso was most likely created in a New York restaurant, probably in Greenwich Village, a haunt for show people at the time. Chickens and their livers were a great luxury in the South; but readily available in the States. Take Caruso’s love of the livers, their affinity to mushrooms, and Naples love of pasta and gravy; Voila! a dish worthy of the golden voice. As we remember the war to end all wars; picture Enrico standing tall in Union Square, The doughboys marching off to Europe, singing “Over There”, first in English, then, in Italian. More tears than Vesti la giubba. Il miglior sito di ricette italiane all’estero…e in Italia stesso! attendibile al 100%! io sono napoletana e vengo qui ogni volta che cerco una “vera” ricetta italiana: Grazie Frank! ? Sadly, I am one of the ones who wasn’t familiar with Enrico Caruso. Until now, that is. I love the story, albeit somewhat tragic due to his death at a young age. But he has left a legacy not only in the music world, but also the food world thanks to this recipe. It sounds like a wonderful Southern Italian recipe, and I love the use of zucchini here. I’ll have to keep this one in mind once our zucchini from the garden start to come in! I’m sure you guys will enjoy it, David, especially with zucchini from the garden. I so enjoyed this post. First and far most because it’s well done, but also because it’s about a dish that’s likely my favorite pasta recipe. I have four Romanesco zucchini plants that I’m nursing (hard to grow in these cooler climates) in the front garden with great hopes that they will bear fruit for such dishes. Oh, and the “Victrola”, I have fond memories of turning the crank, ever so gently, on my grandfather’s Victor Talking Machine. Well, Ron, then I guess we’re both “of a certain age”… 😉 This dish will be wonderful with home-grown zucchini. And I love the Romanesco variety, bravo for getting to grown in those northern climes! This is a gorgeous heathy and light recipe. I could have this right now! A classic Mediterranean dish. Very nice Frank. Very interesting post about the history behind the man and the pasta. I’ve not had this pasta dish before but it sounds perfect with ingredients from from the summer gardens. Thanks, Karen. If you like those flavors, I’m sure you’ll like this pasta. I listened to those same scratch recordings from my paternal grandfather…memories. Thank you for bringing this particular dish to my attention, although I have concocted similar style pasta dishes in the summer I had no knowledge of a specific link to Caruso. We strolled past the Hotel Vittoria in April and a friend told of os Caruso’s fondness for staying there. Wonderful recipe with a lovely story behind it. l’apertura del mio nuovo B&B a Trieste mi impegna tantissimo ma passare da te e ammirare i tuoi piatti è sempre un piacere, bella e gustosa ricetta Frank ! Passa dal mio blog a leggere così magari un giorno verrai a trovarmi sul serio, un abbraccio ! LOVE the history and the dish sounds awesome. I would stay away from the chicken liver recipe you mention, however. As much as I have tried to like liver in all sorts of ways… I just can’t do it. Really, I have tried. I have had one pate that I have enjoyed, another dish where the liver taste was hidden by marinade and bacon, and finally a macaroon. Yes, a liver macaron, that was actually pretty tasty. It was so bizarre. Wow, a liver macaroon… now I think I’ve heard it all. 😉 But I’d definitely try it. Thank you for such an educational post. Truly appreciate Caruso’s eternal works of art ! They are wonderful, aren’t they? What an interesting story, thank you for sharing, Frank. This pasta dish is exactly what I would love as I am not a fan of the heavy tomato sauces for the reasons you mentioned! I’ve never had bucatini, I’m curious as to how the shape places into the light sauce. I am growing zucchini’s but they won’t be ripe for some time. Well, I think I’d wait for those zucchini from your garden to make them. And if you’re growing tomatoes, too, by any chance, that’d be a real treat! Yes, I am growing small grape tomatoes as well as Campari, can’t wait. I’ve been planning on making this recipe ever since I heard the song Caruso and then read the book Caruso written by his wife. I’ve been fascinated by the great singer and when I heard about his favorite recipe I knew I had to make it and post. Love reading about this — you’ve piqued my interest even more in the great singer. I haven’t read the book. I’m sure it’s fascinating. This dish looks delicious, Frank. Since Caruso was a man, why is it called “alla Caruso” rather than “al Caruso” ? Good question, Nick! In recipe names, as you probably know, “alla” (short for “alla maniera di”) means “in the manner (or style) of” and doesn’t vary by what follows it. On the contrary, what follows conforms to it: “alla napoletana” for example, where the napoletana is feminine to accord with “maniera”. So “alla Caruso” is actually short for “alla maniera di Caruso” or in the manner of Caruso. Now, on the other hand, there is a dish called “pasta allo scarpariello”—pasta in the manner of the shoemake—where the opposite is true. Not sure how to explain that one grammatically. Ah, I understand. Thank you for the explanation! A gorgeous plate of pasta and a wonderful sauce. A great story about Caruso. Frank, I have a question, are you familiar with a magazine called La Cucina Italiana? I have several of them and just love them. Unfortunately I can’t find the one I am looking for. It had a recipe for roasted apricot ice cream. By any chance do you have the recipe? Yes, of course, I know the magazine well. But I don’t read every issue. Afraid I’m not familiar with that particular recipe, although I can more or less imagine how it would be made just by the title… I’d roast the apricots, purée them and mix them with a basic gelato custard before freezing. Can’t imagine it’s too much more involved than that—perhaps a little liqueur, perhaps some of the apricot is left in small dice rather than a purée, perhaps another ingredient (crushed nuts?) is added, but that’s all gilding the lily, I’d say. Thanks Frank, I your basic gelato recipe looks great. In the meantime I am making a roasted apricot sorbet . I want to stay in a hotel room that comes with a piano! And I want them to serve this dish in the hotel restaurant! Actually, my mom just confirmed that we still have those Caruso LPs in the attic! Happy days. A lovely dish… looks delicate. I particularly like the sauce, which is not cooked to smithereens as some people seem to believe should be done with tomato sauce. Basically, this is how I make my tomato sauce. Thanks Juliet! I do like those long-simmered tomato sauces from time to time, but as you say, a lightly-cooked sauce can be lovely, too, and a better choice for a daily cooking. Beautiful plate of pasta, Frank, and I love knowing Caruso’s story, sad and tragic as it is. I became a big fan of opera when I was in music school… and loved hearing old recordings of Caruso, Callas and the like. I look forward to trying this while streaming some Caruso performances to keep me company in the kitchen. Thanks, David! Preparing bucatini alla Caruso while his singing keeps you company… sounds perfect. Beautiful, and what a lovely sauce! I will definitely try this – maybe with grilled zucchini. I didn’t know all the details about “alla Caruso” so I appreciate the back-story for this recipe. Thanks, Laura! Caruso was indeed a fascinating character, wasn’t he? Oh this sounds right up my street! I’ve got an abundant crop of courgettes coming along in the veg patch. I thought of roasting the tomatoes, perhaps to intensify the flavour. Wow, a pasta dish named after my last name. My grandfather back in the day would listen to Enrico Caruso records all the time so I’m greatly familiar with his music. I will certainly give this recipe a try as I’ve already made a lot of the wonderful pasta dishes from this web site. Thanks for the kind words, Leo! No relation with the great man, I take it, or…? I’m sure that would be delicious, Susie.